With the real estate market starting to show some signs of slowing down, some home sellers are starting to offer incentives to home buyers to encourage them to buy their homes. First time home buyer incentives and home buyer incentives in general, can be tempting. However, buyers should be asking themselves. Why is the seller offering that incentive in the first place? What exactly IS the incentive and are there restrictions as to whether I get the incentive or not? If I accept the incentive, what might I be giving up instead? Well, the answer is sometimes incentives really are a win-win for the buyer but sometimes it's just a distraction from something else. Why do sellers offer homebuyer incentives? The short answer is that sellers don't offer them when they know the home will sell quickly. If the seller and their agent think that the home might struggle to sell, then they will consider the option of dangling some incentive in front of the buyers to make the purchase more enticing and grease the wheels of industry towards a closing. The are lots of different home buyer incentives and the type of offer might depend on whether the home is a resale by a homeowner or if the home is brand new construction and the seller is a builder/developer. Work with the builder's lender for a discount. Many builders require that homebuyers get pre-approved by the builder's preferred lender, even if the buyer has been pre-approved with their own lender already. Also, some builder's lenders will offer some incentives like $3,000 paid towards the buyer's closing costs or maybe pay for the appraisal if you work with them. So is this a good deal or not? You need to do a direct, side-by-side, apples-to-apples comparison of loan estimates from the builder's lender and your own lender. How do the two interest rates compare, what are the total closing costs, are you required to pay points (buy down the rate) and what are your actual monthly payments? If the builder's lender is offering to pay $3,000 towards your closing costs but their closing costs are $5,000 higher and your monthly payments are higher, then that's not a good first time home buyer incentive, is it? And, remember that you are under no obligation to work with the builder's lender are completely free to go with your own choice and decide whether to choose a bank or a mortgage broker for your loan. An incentive for in-city homes with no garage. In the age of ridesharing and with more people deciding not to own a car, some builders are offering rideshare inducements. Recently, I helped a buyer couple buy a new construction home in Seattle where the builder was offering $3,000 worth of Uber or Lyft service for a year. Was that a good incentive? In their case absolutely. They had embraced the car-free lifestyle already, so it was a perfect fit for them. But for a buyer with a car in a neighborhood with competitive street parking, that home would not be a good fit regardless of the incentive. For fully completed, new construction homes, the builder might offer window treatments (curtains or blinds), maybe add a fence or maybe throw in a fridge or washer and dryer. The latter are frequently missing in new construction homes. For some buyers who own a dog and who will have an anemic checking account after closing, a fence around the backyard would be a perfect first time home buyer incentive. Another buyer, however, might prefer to choose their own matching, top of the range washer and dryer rather the mid-range ones the builder is offering. Plus, "can I take a look at those window treatment you are offering first, please? Seller offers the buyer a home warranty. Here the homeowner is offering to pay for a home warranty for the buyer which usually covers the first year the buyer lives in the home. Home warranties usually cover things like repair and replacement of major appliances and repair and replacement of components for larger systems like heating and A/C, water heaters. electrical and plumbing systems. Some home warranties are better than others and they always have lots of small print restrictions that can limit their usefulness. Plus you will probably be expected to make some kind of copayment if you use the service....assuming you get them to come out to the home in the first place. Home warranties DO NOT cover large items like leaking roofs, cracks in the foundation, the need for new windows or a collapsed sewer line. For an older home resale, a home warranty can seem like a comforting reassurance to buyers that if anything goes wrong with the home after closing, everything will be taken care of. NOT! 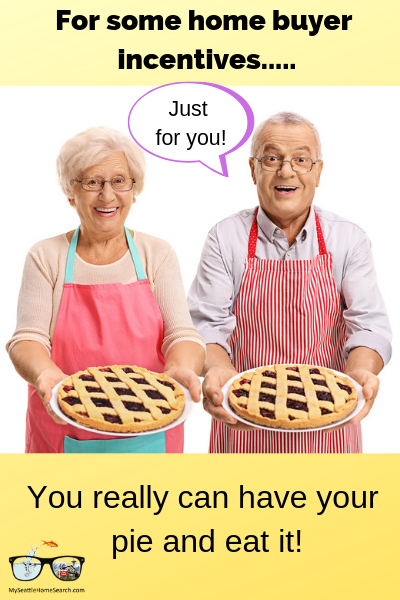 If the home is a lemon, adding a home warranty will still make it a lemon! Home buyers should be wary of relying on a seller's pre-listing home inspection. Do your own home inspection with your own home inspector. A seller credit towards a known repair. Say the sellers know that the deep shag purple carpets have seen better days and need replacing but don't want the hassle of having to replace them before closing? The fact that they probably should have replaced them before going on the market is neither here nor there. 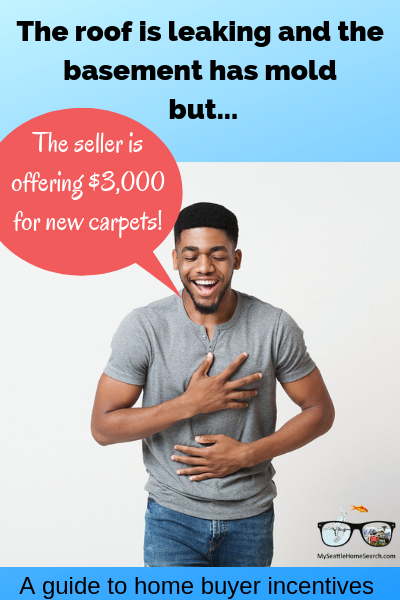 The sellers don't want the carpets to kill the sale so they preemptively offer cash back at closing to the buyers so that the buyers can buy and install new carpets of their own choosing after closing. The "cash back" takes the form of the sellers paying some of the buyer's non-recurring closing costs at closing. Could this be a good incentive? Sure, especially if the buyers were intending to put down new wood floors and were intending to rip up those carpets anyway. But if the buyers want to replace the carpets, does the amount the seller is offering cover the cost of the installing new carpets? Seller offers to leave all the furniture. This can be great if the buyer has only a few sticks of furniture themselves and are, say, moving from a 1-bed condo to a 3-bedroom house. They can move into a fully furnished home and potentially save thousands of dollars that they would have had to spent furnishing their new home. However, what condition is the furniture in, how old is it and does it match your personal taste? The seller may just want to leave the furnishings because it might be cheaper to buy new stuff after they're relocated than pay for the shipping and insurance costs of moving the stuff. Does furniture increase the value of the home? No. The furniture and the home/property are two totally different things. Appraisers don't take the contents of a home into consideration when determining the current market value of a home. Buyers should do the same. While this is not strictly a homebuyer incentive, it might be an incentive for the buyer's agent to encourage the buyer to purchase the home...without the buyer ever being aware of the existence of this incentive. This is an agent incentive, not a buyer incentive. A home might be sitting on the market and not selling or the sellers might want to close by a certain date for tax benefits. The seller's listing agent suggests that the sellers increase the buyer's Realtor's commission by a certain percentage. Agents will be able to see this in the Agent Only section of the local MLS ...but it will not be visible to the general public. Can the potential of a bonus commission check influence how a buyer's agent might perceive a listing that they previously ignored? Sure it can! Does that mean that they will definitely tell the buyer? No guarantees there. There is nothing illegal with a buyers agent being offered a higher commission if they bring a buyer but an ethical agent should be upfront about the potential bonus and probably should split the split with the buyer. For example, have the sellers reduce the sale price by half of the amount of the incentive, or even better, all of the incentive. So back to those 3 questions at the start. Why is the buyer being offered an incentive in the first place? Because the seller is trying to encourage the buyer, to purchase their home and the seller already knows it might be a bit of hard sell. The home might be in an odd location, need some repairs, it might be a condo with an upcoming special assessment or a new townhome without a garage in a busy location. Or the home might be way over-priced and the seller is hoping some unlucky buyer will be dazzled by the shiny object incentive. As a home buyer, stand back and ask yourself "why is the seller offering that incentive?" What exactly IS the incentive and what are restrictions? Often times, home buyer incentives are vaguely worded on some flyer on the countertop at the open house or included on the MLS listing with few details. Sometimes it's hard to know exactly what is being offered. For example, for a home warranty, what does, and doesn't it cover? What will my out of pocket expenses be if I use the warranty? The builder is offering free window treatments on the new construction home. Do I get to choose the style I want or do I get the only ones they have sitting in their warehouse? Will the repairs credits actually cover the cost of the needed repairs, like that new carpet incentive mentioned above? Also is it legal to offer that incentive in my state? And most importantly, do I have to pay full price to get the incentive or can I still negotiate the price and needed repairs? If you do accept to accept a buyer incentive, make sure to get it in writing and that it is part of the contract. Don't take the seller's word for it. What might I be giving up if I accept a home buyer incentive? It's likely that in order to get the incentive that you will have to pay the full list price and potentially may have to buy the home as-is. So if the home is clearly over-priced by $25,000 and the incentive is a mere $5,000 towards your closing costs, paying full price would not be a good idea. You are better off ignoring the incentive and trying to negotiate the seller back to reality and a lower sale price. And while a home is worth what somebody is willing to pay for it, the appraiser may think otherwise. Similarly, if the builder's lender is offering $3,000 towards closing costs but your actual monthly mortgage payments are $87 higher, then you are giving up a lot of money over the duration of the mortgage, and that $3,000 "saving" will be long gone. 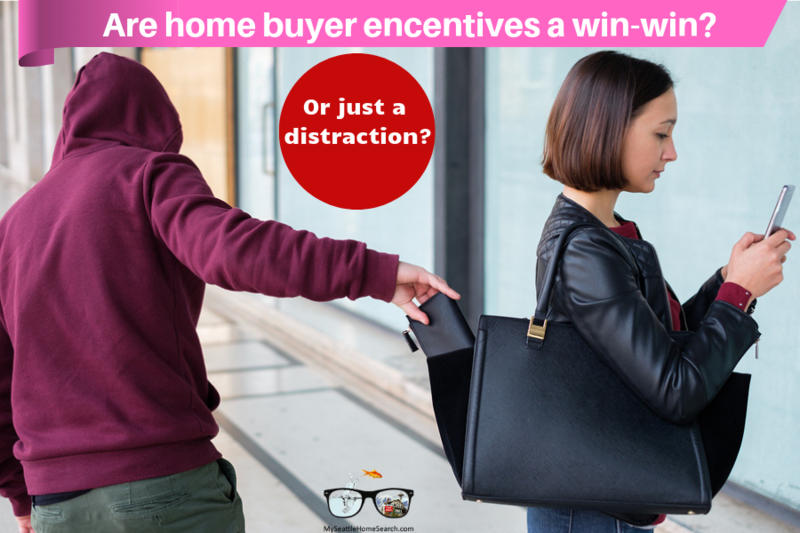 To summarize "Are home buyer incentives a win-win or just a distraction?" Sometimes buyer incentives can be a nice bonus for the right buyers under the right circumstances, you just need to know exactly what you're getting and crunch the numbers. Keep your eyes on the prize and don't be distracted by shiny objects! 11 Of The Best Home Buying Tips from Jamohl DeWarld. Understanding The True Market Value of a Home from Kevin Vitali. Things Buyers Wished They Had Known Before Buying a Home form Lynn Pineda.